In Louisiana, a merchant owes a duty to persons who use his premises to exercise reasonable care to keep his aisles, passageways, and floors in a reasonably safe condition. This duty includes a reasonable effort to keep the premises free of any hazardous conditions which reasonably might give rise to damage. Premise liability cases include: ” slip and falls at commercial establishments caused by liquids or foreign substances; ” trip and fall incidents caused by unsafe property conditions; “construction site accidents and, assaults by employees or business patronsIn many states, business owners and property owners have a duty to provide a safe environment for individuals on their premises. 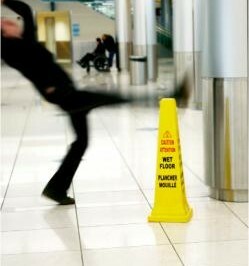 If you are involved in a slip/trip & fall accident, you should (1) avoid making any detailed statements concerning fault; (2) get names of owners and managers of property; (3) write names of witnesses; (4) take good pictures of scene and injuries; (5) save footwear and clothing; (6) seek medical attention if injured; and (7) not give recorded statements to insurance adjusters.